We previewed the @otsocycles Warakin, but now get to see it in person at #interbike #outdoordemo. Stainless steel, big tire clearance, fittings for most bolt-on accessories, and adjustble chainstay length (and minimally, BB drop). 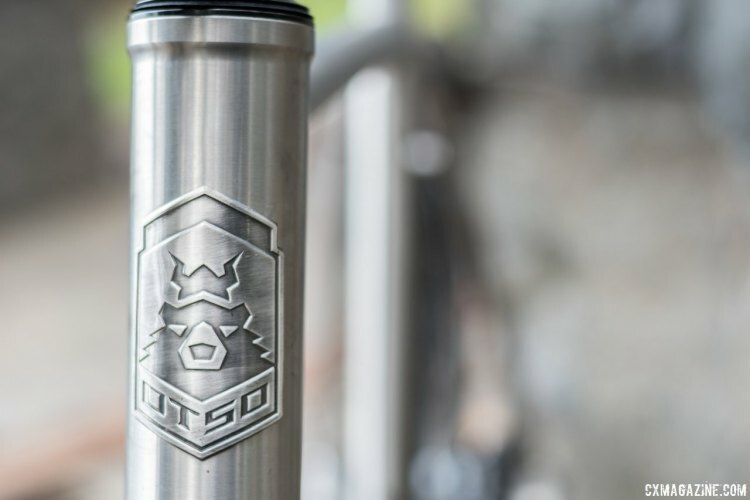 Otso is a spin-off of Wolf Tooth Components and when developing the new line of bikes, the company’s engineers tapped into the innovative thinking that put Wolf Tooth Components and its cogs and adaptors on the map. Today we’re taking a close-up look at our Otso Cycles Warakin test bike, with early ride impressions, in our four-page In Review spotlight slideshow below. The Warakin is TIG welded in Taiwan of proprietary Otso custom butted work hardened austenitic stainless steel tubes that are slender by today’s standards. A 25mm top tube and 28.5mm down tube grace this brushed finished frameset with etched graphics. The headtube is 44mm to accommodate the tapered carbon fork steerer of the Otso-designed carbon fork. 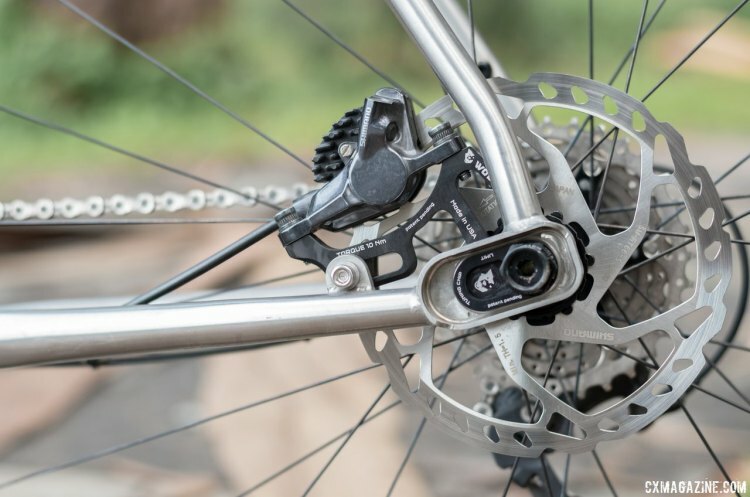 Some stainless alloys used for bikes are martensitic (there are five different families of stainless steel) but the biggest difference is the amount of chromium in the alloy. Austenitic stainless steel has more chromium making for significantly higher corrosion resistance, so go ahead and take your Warakin to your beach house in Maui and enjoy the sea spray. Metallurgy aside, stainless steel has the advantage of corrosion resistance with relatively easy workability and the unique ride quality of steel. Our test bike came with with a BB86.5 with press-in cups and bearings. Every bottom bracket standard has its merits and detriments, but we’re fans of the BB86 format simply because the wider shell can allow for more tire clearance out back due to wide placement for the chainstays, as seen in the carbon Bailey/Louis Garneau/Alan/Sophie de Boer frame. 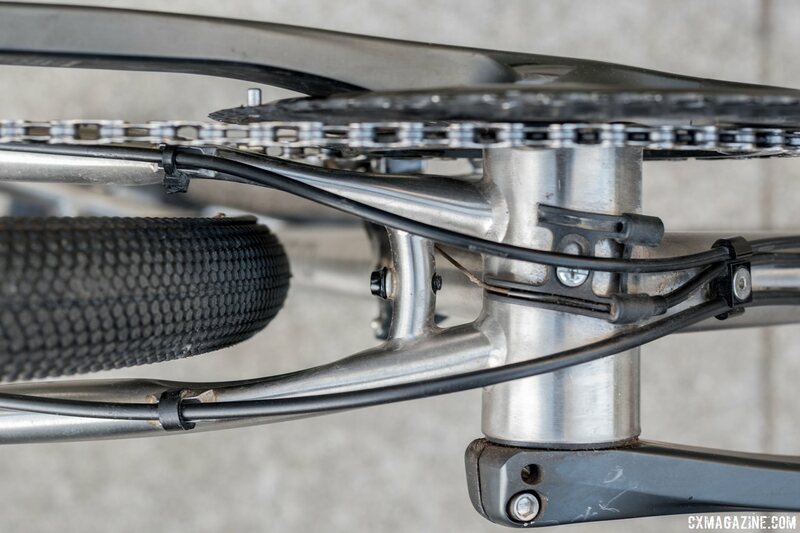 However, on our test bike, the chainstays were placed as if the bottom bracket was 68mm, arching outwards from the point of attachment to achieve tire clearance. There’s a reason behind this, as Brendan Moore of Otso (and Wolf Tooth) reports that the production models (shipping now) will have a 68mm BSA threaded bottom bracket and would maintain the prototype’s chainstay mounting position and tire clearance. In essence, production models will shave off about 9mm on each side of the BB shell. The standout features of the Warakin are the stainless steel construction, impressive tire clearance, and the versatility of variable wheelbase, with a combined change of BB drop. 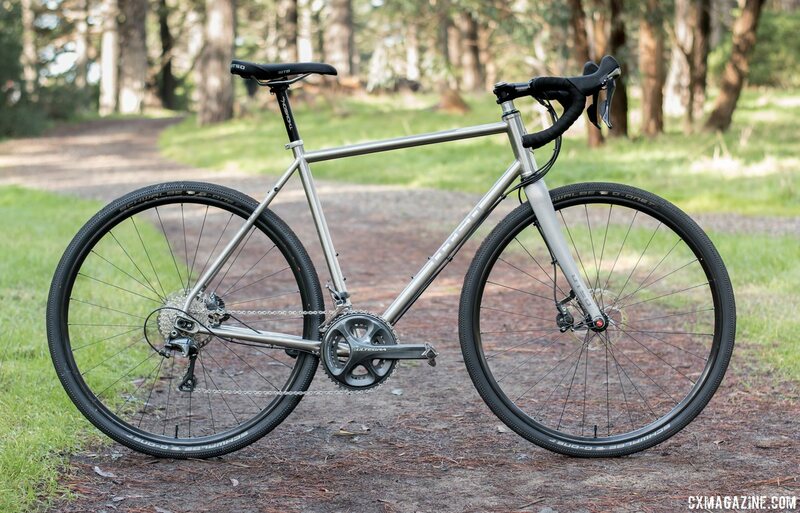 Such adjustability allows a lower, longer geometry for long gravel rides or touring on mixed terrain, but a higher, shorter geometry for spirited performance riding. 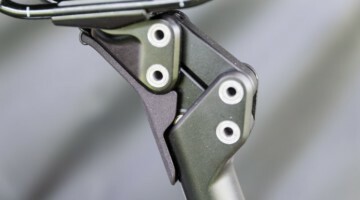 Otso accomplishes this through the Wolf Tooth Components Tuning Chip that allows the thru-axle system to vary its position within a slotted “dropout,” effectively changing the rear wheel placement or chainstay length. The system includes a caliper mount so the rotor stays in proper position. It is not infinitely adjustable. The outer piece can be positioned with the hole forward or back effectively allowing a 2cm position change. If you want to be in the middle, you obtain a “middle position” Tuning Chip from Wolf Tooth. For the Warakin, the chips allows a 44, 43, or 42cm chainstay length. Since the dropout is mounted at an angle, the 20mm wheelbase change also results in a 4mm change to the BB height (for the same tire size), as well as frame angles by +/-0.2 degrees. 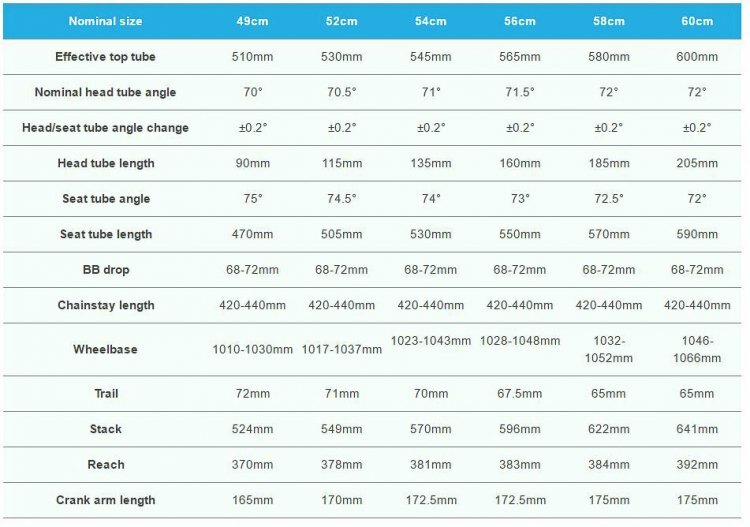 There’s a good chance your bottom bracket height won’t change much at all however, if you use the longer chainstay setting because you want to increase tire clearance for fatter rubber. Bigger volume tires will push your bike back up, offsetting the increased BB drop. Aside from this variable chainstay length with the minor geometry tweaks that go along with it, other geometry parameters remained similar to typical ’cross bikes: a 55cm seat tube combined with an effective toptube length of 55.5cm, a nominal 71.5 degree head tube angle in combination with 73 degree seat tube angle, and a 60.1cm front center. The included Otso carbon fork has a tall 400mm dropout to crown height and a tapered carbon steerer tube. The fork is 15mm thru-axle, a move we applaud so typical mountain bike hubs can be used. The fork on our prototype had a pierced crown and fender strut mountings high on the inner side of the fork blades, keeping the fender struts above the disc brake mount and the outer appearance clean. There are three sets of bottle bosses, the third on the bottom side of the down tube. Rack/fender eyelets are on the seatstays as well as fender mounts on the seatstay and chainstay bridges. Some riders lean towards steel because it’s typically an affordable way to build up a ride. 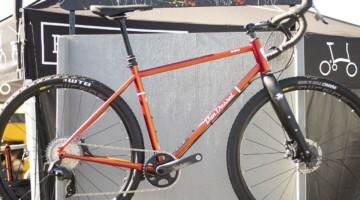 However, the Warakin, at $1799, isn’t after that audience and is priced more than many carbon frames. It’s worth noting that the closest comparison we’ve seen recently, the Soma Fabrications Triple Cross, made from American stainless steel, is $200 more without a fork. See the next page for the build details and ride impressions. Previous post Interview: Sharon Sloan on Racing Her First Cyclocross Nationals - "This Is Better Than Being Dead"